Kadamba Sambar is one such sambar which has its origins in Thanjavur. As the name suggests, Kadamba means flowers of different colors strung together in a multi color garland, and it has multi colored vegetables as ingredients. . 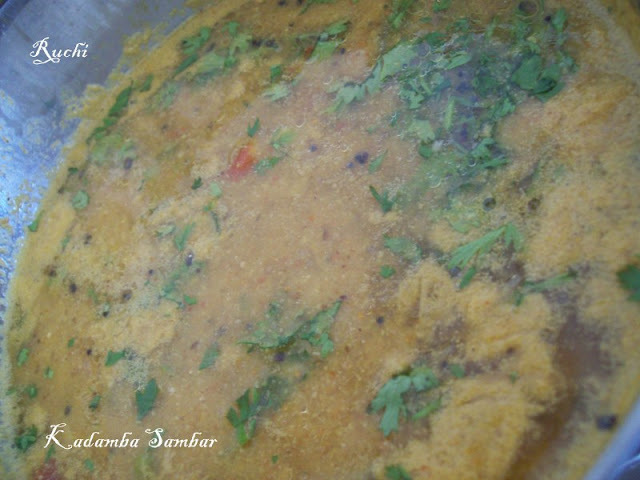 I made this kadamba sambar for our family get together a week back. Here goes the recipe..
2. Take a pan, fry the ingredients given to grind, to golden brown and grind it into a fine paste and Keep it aside. 3. Squeeze juice from tamarind for about one and half cups and keep it aside. 4. Wash n cube the veggies into uniform cubes, cook them with enough water, turmeric powder and salt. 5. Add the tamarind juice when the veggies become tender. 6. Once the raw smell of the tamarind juice has gone, add the mashed dhal, adjust the salt, let it boil for a couple of minutes. 7. Add the roasted-ground masala, adjust the water to the desired consistency of the sambar, and let it boil for 5-6 minutes on medium heat. 8. Heat oil in a small pan, make the tempering with mustard, Fenugreek seeds and curry leaves. Pour it over the sambar and Serve it hot with rice. 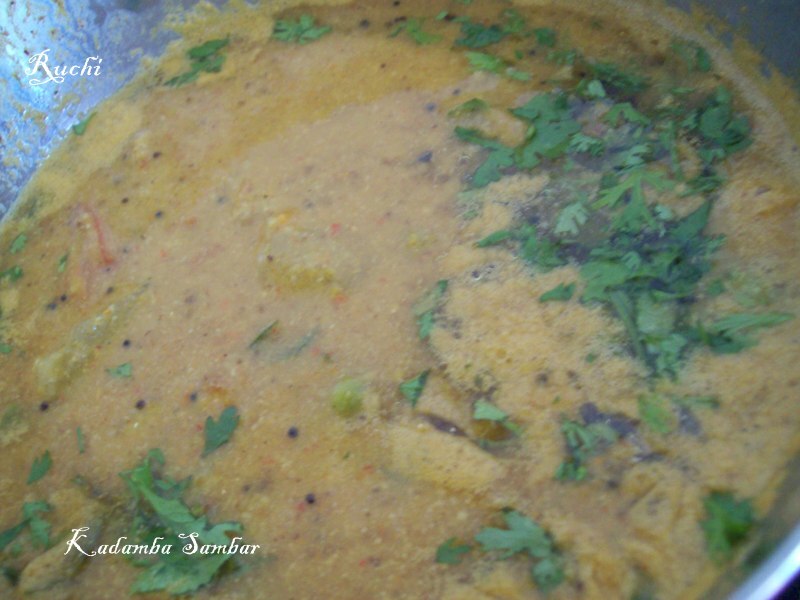 Delicious and flavourful sambar,just love it.